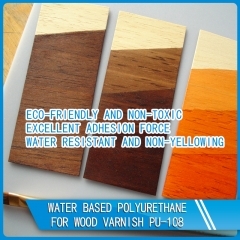 Aliphatic polyurethane dispersion is designed for wood paint. It is used for protecting hardwood floors and other wood surfaces. 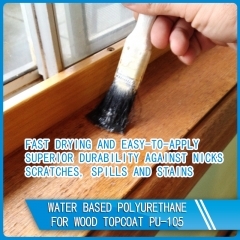 It is fast drying and flows&levels exceptionally well on any wood surface. It dries clear and is non-yellowing to ensure the true natural color of wood. 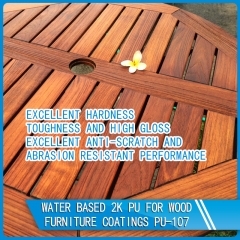 Water based 2K polyurethane systems are a new technology which is already successfully used in many applications also for wood coatings and more specifically furniture finishes, without having to sacrifice quality. Some properties like the ease of introduction by hand of the hardener and the determination of the pot-life through the viscosity increase can be optimized by choosing the right solvent to dilute the polyisocyanate. 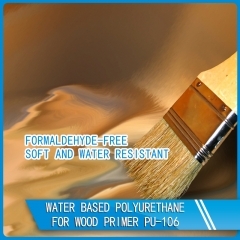 Water based polyurethane is an easy-to-apply, quick clean-up, crystal clear finish for interior wood surfaces. Formulated with state-of-the-art resins, this clear finish is non-yellowing and perfect for use over light or natural wood colors. It dries quickly and can be recoated in only two hours. This extremely durable finish resists abrasion, alcohol, water and virtually all household chemicals. This product has superior hardness and adhesion.